In 1985, in a cornfield here in Sarpy County, Trees, Shrubs & More, Inc. was started. It was a very humble beginning. 36th Street was an untraveled dirt road and Cornhusker Road was two lanes. 72nd Street was dirt south of Cornhusker Road. Today, Trees, Shrubs & More has grown and is as busy as the surrounding roads. In the beginning, we started with rows and rows of trees and a little 24′ x 40′ store. Today, we have a complete, full service Garden and Landscape Design and Installation Center and a growing Orchard. Sarpy County is growing and we continue to grow right along with it. Putting the right plant in the right place has proven to be a great concept. Now with nearly 50 seasoned employees, we’re still putting the right plants in the right places. Our Garden Center professionals are eager to assist while you do the work or our Landscape Design, Installation, and Maintenance professionals do it all for you. In the spring and summer, we’re here for all of your lawn and garden needs. In the late summer we feature peaches, pears and other fresh local and regional fruits. And, of course, apples that are grown right here in our orchard!! In the fall, we have some of the biggest and best mums you’ve ever seen, as well as pumpkins, cornstalks and other fall items. In the winter, we sell Fresh Christmas trees and holiday décor and we also provide commercial snow removal services and sell and install salt in bulk. 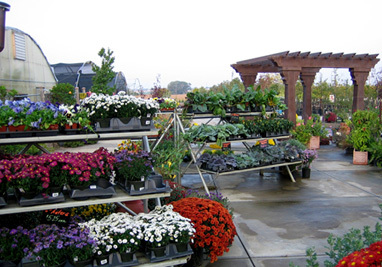 We’re here year-round for your garden needs and More!